The EU has the Action Plan against Wildlife Trafficking in place, and we are expecting a review on this by July. In addition to this we are writing a report on combating the destabilizing effects of wildlife trafficking in African, Caribbean and Pacific (ACP) countries and promoting the implementation of the external dimension of the EU Action Plan against wildlife trafficking. Yesterday we were joined by representatives from ACP countries to discuss the implications of the vast and growing global problem of Wildlife Trafficking. We discussed the criminal networks that are behind wildlife trafficking and how it is linked to wider criminal activities, drugs, guns, human trafficking, terrorism and there was the suggestion that cybercrime should be added to this ever growing list of security risks that wildlife crime helps to facilitate. We had the honour of being joined by wildlife activist and Eagle Network founder Ofir Drori who offered us his views based on his years of experience fighting corruption that surrounds the illegal wildlife trade, and using the example a case study from Ivory Coast and their illegal trade links in guns, drugs and humans. Ofir used an excellent analogy to explain how wildlife traffickers are creating their own market. He explained that he owns an iPhone, but he did not wake up one morning feeling like he needs that phone, it is through the marketing of the product that he decided he needs that phone. People are buying rhino horn not necessarily because it is tradition, but because as long as traffickers are making money from it they can create a market for it. However there is a false believe that it will cure cancer the truth is rhino horn does not cure cancer, it is keratin the same substance that is in our fingernails, if keratin cured cancer then fingernails would be the obvious cure. 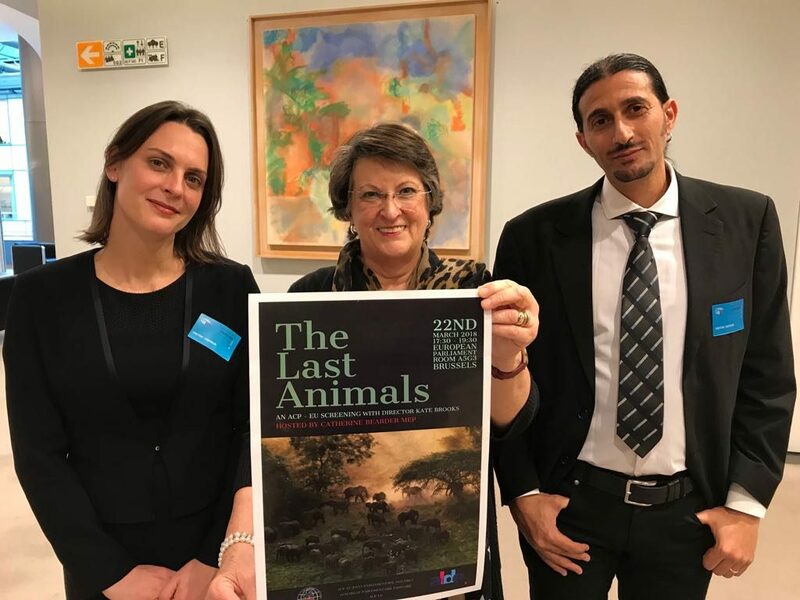 We were also joined by photographer Kate Brooks, who directed The Last Animals for a screening of this documentary film. A hard hitting documentary film that examines the rate of extinction due to the illegal wildlife trade. The film showed the true extent at which elephants are being slaughtered to feed to the ivory market and examined the decline in the northern white rhino subspecies. Particularly topical after losing Sudan the last male northern white rhino this week. As they are driving fauna and flora to extinction, we must take more action to ensure that the criminals involved wildlife trafficking receive the tough penalties they deserve to ensure that humans are not the last animals. Poachers beware, environmental defenders are now protected!